THE ONLY VENUE IN AUSTRALIA WITH ALL THESE ATTRACTIONS! Come for one experience, or come for several in a combo! For players 16 years and over. 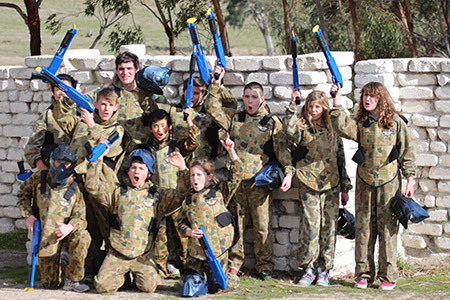 Hot Shots offers affordable and fun filled paintball and has created the most elaborately built field in Australia. Hot Shots is not like any other field. With our paintball facilitiy close to Melbourne, Geelong, Little River, Werribee and the western suburbs, we offer a superfield that guarantees hours of fun. A great experience for special events and team building sessions, or simply a way to create some friendly competition between mates. We’re not your average paintball field, here at Hot Shots we offer a wide range of battlefields to immerse yourself in, complete with awesome realistic backdrops that you have never played on before. Choose from 11 different fields that combine a natural bush setting with a range of thrilling themes including, Battleforce Pacific, Wild West town, Egyptian Village and much more. For players 10 years and over. The awesome fun that is a paintball session is now available for kids 10 years and over. It’s a smaller, low-impact version of paintball, perfect for kids, teenagers and adults. Hot Shots’ kids’ paintball uses low impact markers. Now everyone can play on our world famous fields! Awesome fun for kid’s birthday parties, school groups, youth groups, scout groups and hens parties. Just 45 minutes from Melbourne or 25 minutes from Geelong. It’s all the fun of paintball just smaller. Looking for a “NO IMPACT” experience with just as much fun? 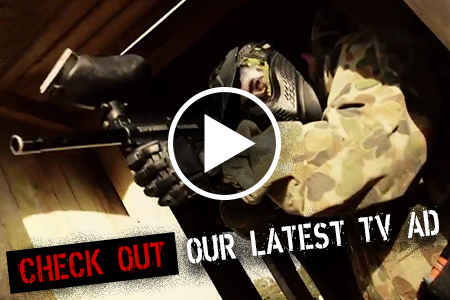 Take advantage of the biggest and best laser skirmish field you’ve seen. Tag your opponents with a laser rather than paintballs on our famous fields. This is a great option for the kids and perfect for parties or families that wish to include people of all ages. Our facility offers plenty of room to chase down your enemies and fire, as well as places to hide when necessary. We also have the most awesome Granite Boulder bush fields – unrivalled for their extreme intensity. Our laser skirmish will provide an unforgettable experience, great for hen’s parties, corporate events, kids’ parties and a family fun activity. Choose from the largest stock of paintball gear in Australia. We can gear every type of player in the latest paintball equipment on the market. We stock all the major brands for Bushball, Tournament and Field Supplies at competitive prices. 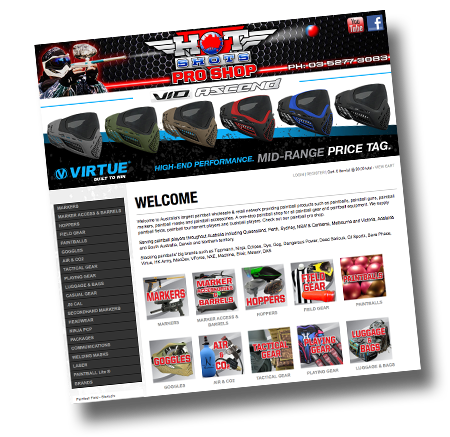 Please note: HOT SHOTS PAINTBALL SHOP is a separate entity from the PAINTBALL ADVENTURE PARK - GAMES SITE. Conveniently located between Melbourne and Geelong, we are the perfect solution for families over the western suburbs and beyond. We are open 7 days, so we are great for that mid-week corporate event or weekend party. If you would like to learn more about our availability or the entertainment options on offer, please get in touch with us today to discuss bookings.